There's no secret to what makes great baseball hitters - practice, and lots of it. With the Polyball Tutor, you can take batting practice anytime because you don't need a lot of space...and you don't need a batting cage. The Polyball Tutor pitches baseball-size plastic polyballs that you can hit with a regular bat, so the hand-eye coordination is exactly the same as hitting baseballs. The recommended pitching distance is 30 to 45 ft., so the Polyball Tutor is ideal for indoor use in gymnasiums and basements, as well as backyards. The Polyball Tutor actually accelerates hitting improvement because with polyballs there is no fear of getting hit. Players learn to "hang-in" instead of "bail-out" against tough pitches. That's why so many high school, college, and professional players and teams use the Polyball Tutor. 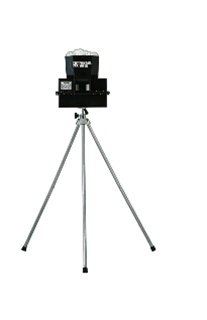 The Polyball Tutor's variable pitching velocity will challenge hitters at all levels. It throws pitches from a gentle toss to 60 MPH. And by moving it closer to the batter you can safely simulate speeds up to 90 MPH. Height and turret (side to side) controls make it easy to adjust pitch placement. 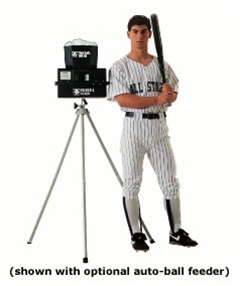 The tripod legs also adjust to a lower height for younger batters. Polyball Tutor's tripod legs detach in seconds for easy transport. And it weighs less than 28 pounds, so almost any player can carry it. For the utmost in portability, the Polyball Tutor Battery Model is powered by an internal rechargeable battery. The battery provides up to two hours of practice per charge, and can be recharged up to 1,000 times before replacement. It comes complete with a plug-in charging unit that fully recharges the battery overnight. You can use it in the backyard, or take it to the local park or playing field and never worry about long extension cords or electrical outlets. 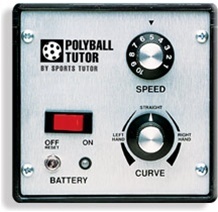 Polyball Tutor's exclusive curve control lets you adjust pitches quickly. A simple turn of the dial lets you select a straight fastball, a mildly breaking slider, or a sharply breaking curveball. The Polyball Tutor is available with an integrated automatic ball feeder that holds up to 40 balls and automatically pitches at six second intervals. With the automatic ball feeder you don't need a coach (or dad) to feed balls into Polyball Tutor - it does it for you.